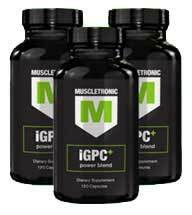 Muscletronic iGPC+ is the complete supplement. It can be used to help you lose weight by burning body fat – which then gets converted into lean muscle mass to enhance the contours of your body. Muscletronic can be used pre-training supplement designed to synchronise the mind and body sufficiently to ensure “blistering performance” in the gym. A lack of motivation and focus in the gym can be as detrimental as muscles that are quickly fatigued or lacking in strength, so the Muscletronic “mind and body” approach has a lot to be said for it. Although such benefits are highly desirable, in many ways it’s all just a rewording of the traditional hype. However, it would be unwise to dismiss Muscletronic prematurely because the manufacturers have seen fit to provide customers with a 60-day money back guarantee. That’s a generous time period that allows plenty of product evaluation time. If the manufacturer is willing to offer a guarantee like that they obviously do not anticipate any returns and that says a lot. Let’s take a look at the ingredients and see what has inspired such confidence. Alpha-GPC (75mg): An ingredient that provides choline. Alpha-GPC is a popular nootropic ingredient that has the ability to enhance brain cell function, improve focus and concentration, and give energy levels a boost. Vitamin B Complex (17.94mg): A dose of important vitamins that has the potential to improve the metabolism and help the body to extract nutrients from food. This ability will have an indirect, but very positive, effect on energy levels and the processes involved in muscle growth and repair. Alpha Lipoic Acid (300mg): ALA is an antioxidant that is found in every cell of the body. It can smooth the conversion process required to turn glucose into energy and help ensure the muscles do not run out of steam prematurely. Forskolin Extract (250mg): A derivative taken from the coleus forskohlii plant, forskolin that has a longstanding reputation as a libido booster. Some studies suggest forskolin extract can help burn body fat while also assisting muscle growth by improving protein synthesis. Golden Root (150mg): An herb that is favoured as an ingredient in smart drugs because of its ability to banish feelings of stress and anxiety. It can also be invaluable for fighting fatigue and ensuring greater levels of stamina. Caffeine Anhydrous (150mg): A powdered form of caffeine. Apart from boosting energy levels, caffeine has been linked to appetite suppression, and its metabolism-boosting powers can be supported by numerous studies. L-Theanine (150mg): An amino acid that offers many benefits including vasodilation. This ability to widen the blood vessel and provide the muscles with extra nourishment makes it a valuable ingredient for bodybuilding blends of all types. Typical L-Theanine benefits include greater stamina and improved muscle growth. Citrus Aurantium Extract (100mg): An extract sourced from the citrus fruit of the same name. Citrus aurantium provides a fat burning stimulant called synephrine. It is a popular ingredient that is used in numerous bodybuilding supplements and is equally favoured by the manufacturers of weight loss blends. Piperine (6.66mg): A flavonoid sourced from black pepper. Piperine has proven metabolism-boosting abilities, but is generally more highly regarded for its ability to increase the bioavailability of other ingredients. How to Use Muscletronic – The normal dose is two capsules, and two does are required each day, but new users should start with just one dose per day, for the first five days, so they can monitor for tolerance issues. Muscletronic is designed to be used in a cycle of 12 to 15 weeks on, followed by 1.5 to 2 weeks off. The capsules should never be taken within 5 hours of going to bed. Women who are pregnant or nursing a child should ask their doctor’s advice prior to commencing supplementation. Individuals who have existing health problems, or use medication, are also advised to obtain a doctor’s approval prior to using Muscletronic or any other brand of food supplement. It is inadvisable to use Muscletronic in conjunction with other caffeine-providing products. The fact that Muscletronic is designed to ensure the mind and body are equally primed for workout success is rather impressive, but a lot of work is required to turn a good idea into a fully functional product. However, close scrutiny of the ingredients that make up the formulation suggests a powerful product, so it is easy to see why the manufacturers felt they had nothing to lose by supplying such a generous guarantee. Muscletronic should prove to be an invaluable training partner for anyone who wishes to take their workouts to the next level and attain a marked improvement in their physique. 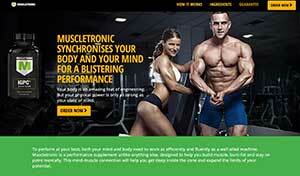 Muscletronic is only available via the manufacturer’s website. It has a 60 day money guarantee that underlines the manufacturers confidence in their product. The best value package is the buy 4 bottles and get 2 bottles free which equates to just over $39 each.